2. Who Says Flying is Fun? 7. There’s nowhere to pull over…..ever! 9. OK to park here? 11. Checking out where I used to live…..but (sorry) mainly toilet talk! 13. Oh to be in Croydon, now that April’s there! 17. I’m not really a morning person! 18. Speed limit?…………What speed limit? 20. Anyone for a Sherry? 21. Wonderful Church, Wonderful B&B, Wonderful People! 25. 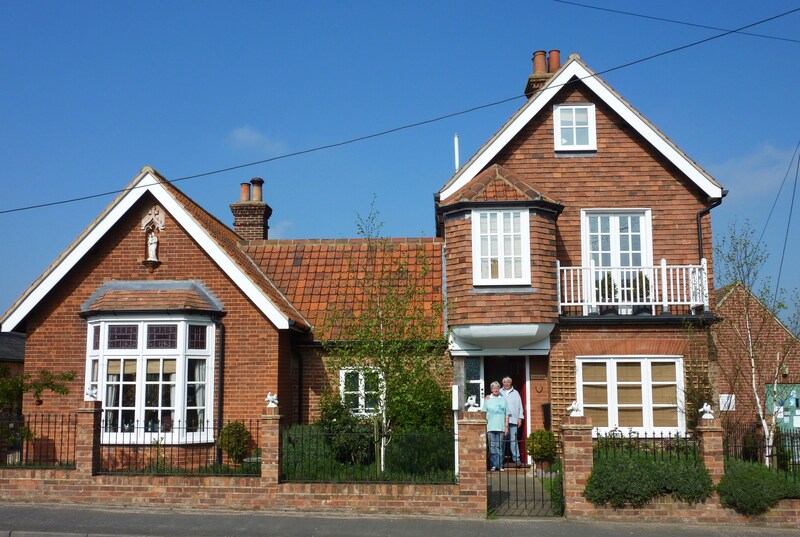 Thorpeness – do I have holiday cottage for you?! 27. Lavenham – anyone for a perpendicular? 28. In the Wilds of East Anglia! 29. I should have hired a comfy car! I guess when you live in this part of the world swimming in the sea is not high on your list of priorities; nor sitting on the beach for that matter – which is just as well seeing as it consists 100 percent of pebbles. A thick, hard to walk on, layer of pebbles. Not a grain of sand in sight. First time I’d seen caterpillars on the beach! What was in sight though were their many and varied fishing boats and the tractors which they used to take them to and from the water. I was astonished. The beach looked like a playground for giants with oversized toy boats and tractors everywhere…tons of photos of this lot…yes indeedy. I loved it. Selling the catch on site. Britten was one of those responsible for devising the Aldeburgh Festival and the concerts took place in one of the old malthouses at nearby Snape. See Snape Maltings . At this point I must recommend Dudley Moore’s performance of his parody ‘Little Miss Britten’ – a send-up of Peter Pears singing Britten songs. Take a couple of minutes to view it on You Tube – time well spent if you have a sense of humour and some knowledge of the singer and the composer. Little Miss Britten is the first of two songs on this clip, the second being a send-up of the German composer Kurt Weill. I find them both brilliant!. You could then move on to Dudley’s ‘Beethoven Sonata’ – his take on how Beethoven might have written a sonata based on the the Colonel Bogey March (most famously used in Bridge on the River Kwai) and his rendition of it about 30 years later on the Terry Wogan show in Britain. 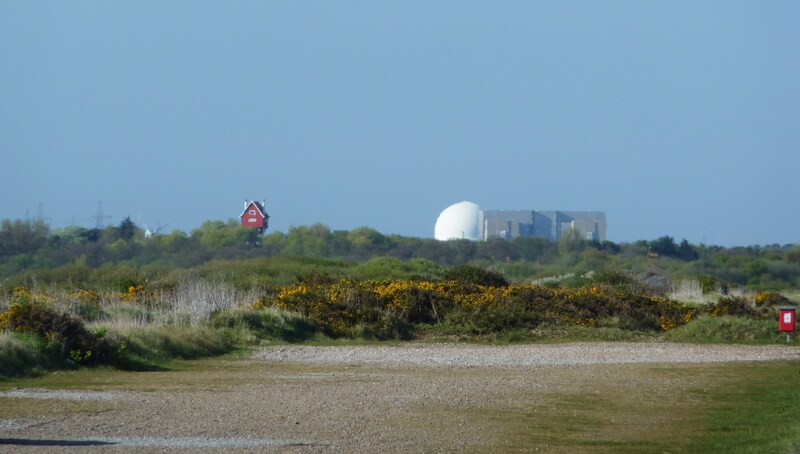 All the while the brooding Sizewell Nuclear Power Station made its presence felt and I was looking forward to a closer look the next day. Even more interesting was the House in the Clouds, now turned into holiday accommodation, but once, with its associated windmill, it was the water tower for the district . I had scoffed at the idea of visiting the place when I saw it in brochures but after seeing the real thing in the distance I couldn’t wait to get up close and personal. But…. I would have to be patient till tomorrow (not something I’m good at!) 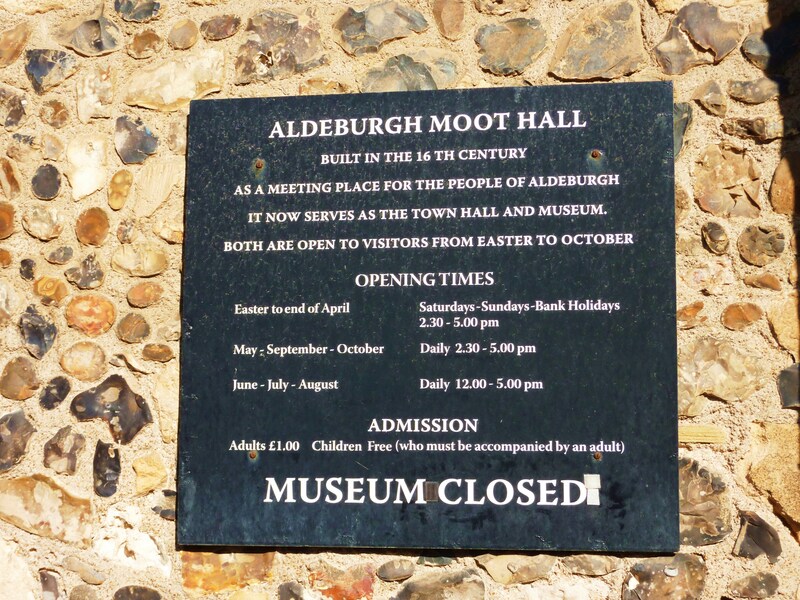 because now it was time to visit the old original meeting place built in Aldeburgh in the 16th century – the Moot Hall. 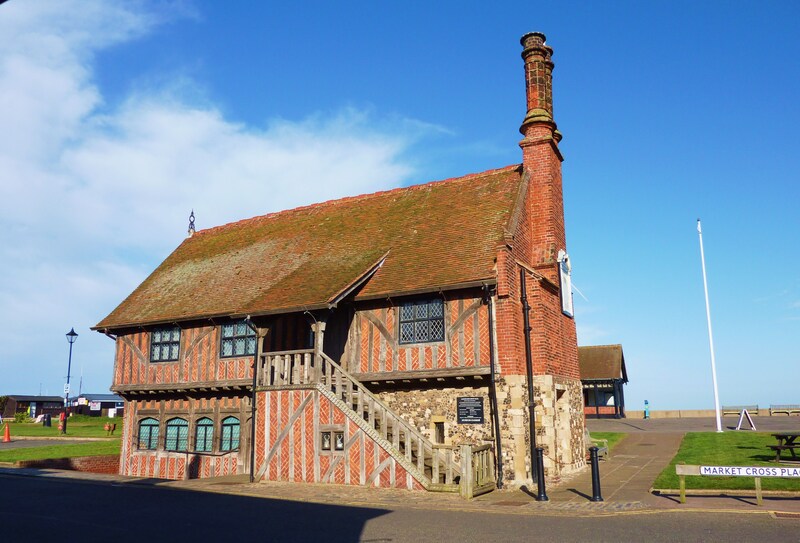 Aldeburgh’s 16th century Moot Hall is a sight to behold and well worth a visit as it is now a museum. The web site is is of great interest and has some lovely photos of the hall. 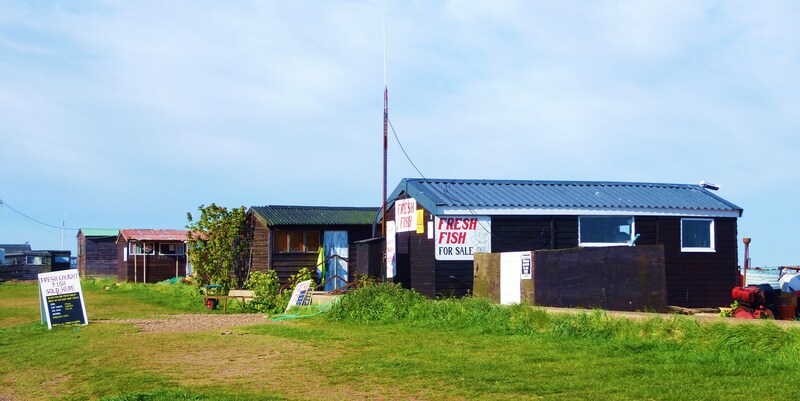 An important fact to remember about Aldeburgh – if you want to be understood by the natives – is that it’s pronounced Aldbra; and Rumburgh is similarly Rumbra, with the accent on the first syllable. 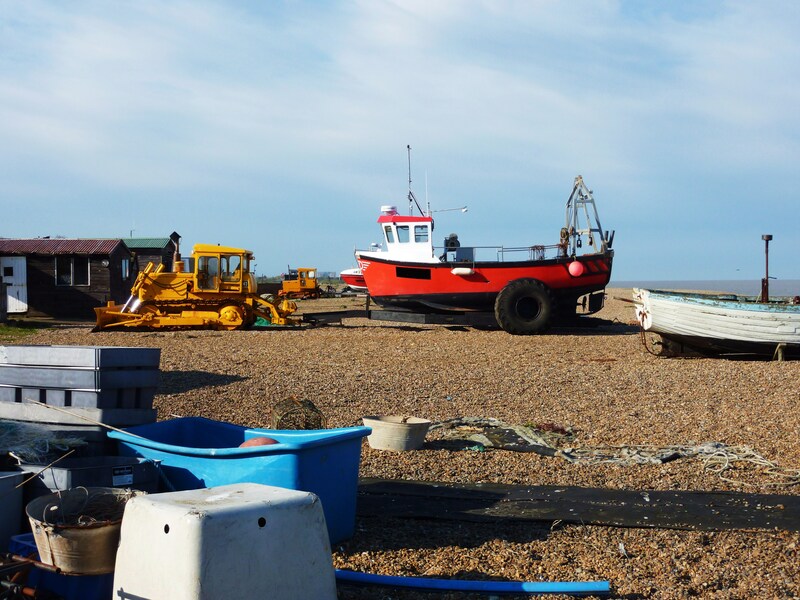 Another fascinating tidbit is that Aldeburgh, along with a number of towns along this eastern coast, has left its footprint at the bottom of the North Atlantic. Over the years the sea has gradually encroached on the built-up areas to such an extent that almost half of the town has been inundated. The case of the nearby town of Dunwich is of particular interest but more of that later. As night fell I said goodbye to Jason and Sue as we were going our separate ways in the morning – they were heading to Heathrow to fly out to join their cruise and I was spending another morning in East Anglia before bracing myself for the drive back to London – something I was dreading. I drove to Snape to get acquainted with my hosts for the night and a very charming couple of women they were – obviously experienced at making people feel welcome and at home. The house had a splendid view out the back of rolling hills and grazing sheep and The Maltings I mentioned earlier was not far down the road. 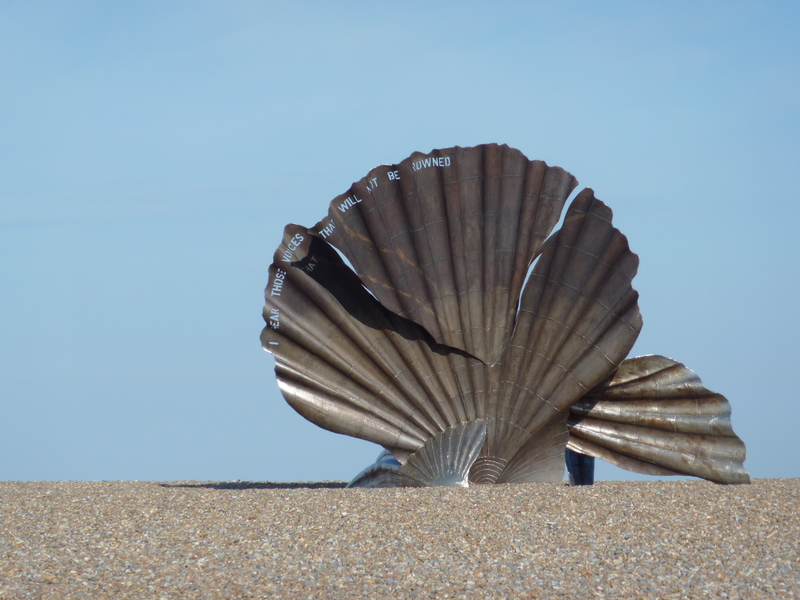 I thoroughly enjoyed my stay and, next morning, after a wonderful breakfast I headed back to Aldeburgh and Thorpeness. The House in the Clouds is in Thorpeness and it is a wonderful sight but this post is getting rather long, so rather than tire you further I’ll be off now. More soon……..promise! 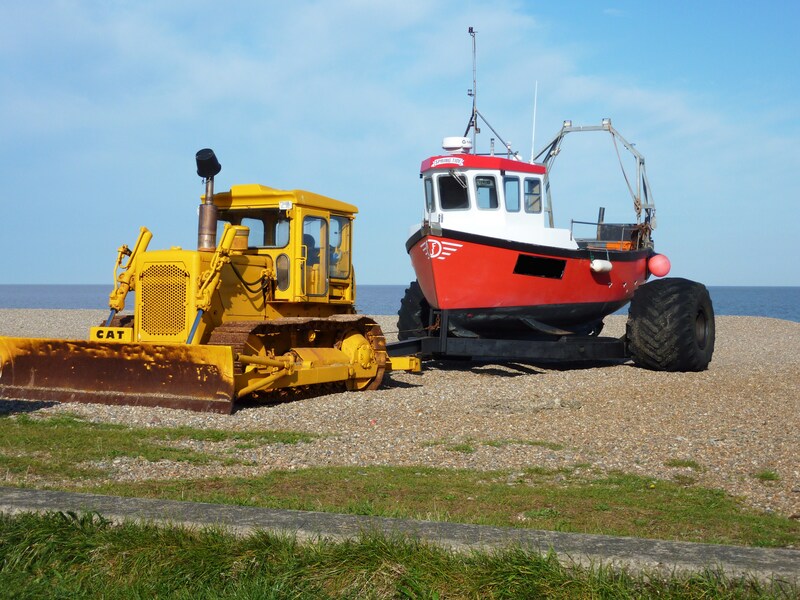 This entry was posted in Aldeburgh, driving, England, Suffolk, Uncategorized and tagged Aldeburgh Moot Hall, Aldeburgh Museum, Benjamin Britten, boats, Colonel Bogey, Dudley Moore, fishing, Little Miss Britten, Pebble Beach, Peter Pears, Sizewell Power Plant, Snape, Snape Maltings, Terry Wogan, tractors, working boats. Bookmark the permalink. 4 Responses to 24. Amazing Aldeburgh! Great post! Love the photos of the boats on the beach! Thanks for your positive comment Mary! I was truly amazed to see tractors all over the ‘beach’. Thank you for the visit, Johan, and taking the time to comment. Glad you like it! © brissiemaz and brissiemaz.me, 2012 - 2014. Unauthorized use and/or duplication of this material (both text and images) without express and written permission from this blog’s author and/or owner is strictly prohibited. Excerpts and links may be used, provided that full and clear credit is given to brissiemaz and brissiemaz.me with appropriate and specific direction to the original content. I am curious! Are you? Life...And What I Make of It!